Tour Technology is a group of tech engineers and designers working together to make innovative products for designers and creators. After several years of research and development, they created an advanced controller with customized creative inputs to simplify and optimize control of Photoshop, Lightroom, and other software. TourBox is the advanced creative controller for Photoshop, Lightroom, SAI, and other image processing software. It is designed for photographers and designers who want to improve their work efficiency. It frees users from endlessly repeated tasks such as drawing, editing, and retouching. It uses a new, straightforward approach that is ergonomic and natural. TourBox is a fully customizable device. In addition to Photoshop, Lightroom, or PaintTool SAI, in future, it will further integrate recommended presets for other popular software such as Capture One, Final Cut Pro, Premiereand many others. A user can also adapt any knob, dial, button or even a combination of them to the shortcuts choosing to suit any software. This opens the possibility to user to customize their own TourBox to best fit personal workflow. With the Engine Tuning capability, TourBox can accommodate an incredibly user-friendly experience at all times. TourBox has inputs like a knob, a roller, buttons, a turntable, each of their rotations can be customized the way a user wants. The company claims that Tourbox’s engine has been polished and fine-tuned over a thousand times to make workflows smooth and natural. The layout design of TourBox makes shortcuts easy to handle. User can easily switch between all tools of PS, LR, and SAI instantly. Changing the complicated keyboard shortcut combinations, with the shortcuts of TourBox. It is also compatible with any mouse and keyboard combination. It has a compact and sturdy design which allows it to carry around anywhere. It only takes a few minutes to master TourBox as there is a little learning curve with the new shortcuts and controls. 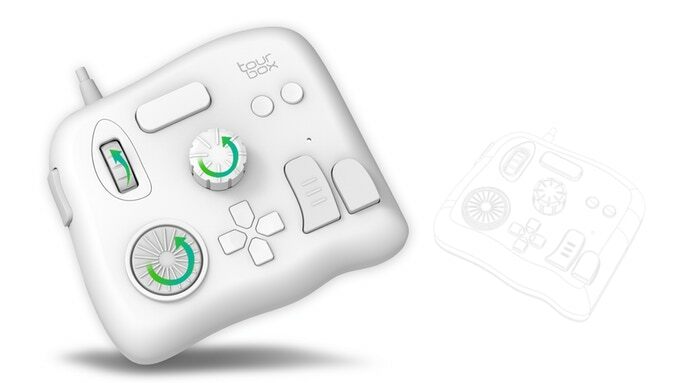 The updated TourBox version highlights new features such as the D-pad and the side button. Currently, on Kickstarter, this new gadget for photographers and graphics designers holds great potential. Backers will get the shipment around December this year. By pledging $89 or more, the backer will get a TourBox and can save 40% OFF retail price.